Unless you go grocery shopping with your eyes closed, you’ve probably noticed that reading egg carton labels nowadays is like reading the dictionary — without the definitions. “Cage-free.” “Free-range.” “Grade A.” “Vegetarian-fed.” What do these even mean? Even worse, some of the terms, it turns out, are virtually meaningless. “The labels on egg cartons are supposed to tell people how the chickens are raised, but there is a bit of sliding here,” explains Lee Ranney, co-owner of a 1,000-plus-acre pasture-raised animal farm in upstate New York. There is some government oversight when it comes to labeling: Certain governing bodies, including the FDA, USDA, state agencies, and independent auditing firms, do indeed determine the guidelines for the phrasing used on egg carton labels, says Hongwei Xin, Ph.D., director of Iowa State University’s Egg Industry Center and professor of Agricultural Biosystems Engineering at ISU. And cartons often include not just certain phrasing, but also seals from these third-party auditing firms. However, most of the label requirements are vague at best and farms aren’t required to use an auditing firm to confirm how they conform. So how do you know if this carton of eggs with fancy words is worth $3 more than that plain carton of eggs? Egg labels can be broken down into three components: the environment the hen was raised in, the health of the hen, and other attributes of the eggs themselves. Put the words together like a math formula and you can determine which dozen is worth your money. Conventional: OK, it won’t actually say “conventional.” But if the carton doesn’t have any of the labels listed below, then the hens are conventionally raised, which means they live and lay eggs in traditional battery cages, which are generally considered inhumane. Cage-free: Eggs were laid by hens who lived without an individual cage in a building, room, or space with area to perch and nest. While this is certainly better than battery cages, most large-scale cage-free farms still have hens packed into tight quarters, Ranney points out. 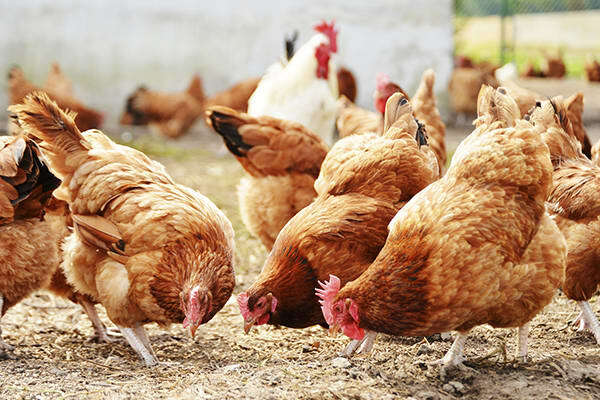 Pasture-raised: Eggs were laid by hens who roam and forage on a maintained pasture area outside. The USDA doesn’t recognize the labeling definition nor does it set the standards, so there are similar issues on how much pasture do the hens actually have, Ranney points out. However, outside of seeing the farm your eggs come from yourself, this labeling is your best bet for humanely treated hens. Natural: “’Natural’ is the most meaningless term — who knows what that is supposed to imply, ” says Ranney. The term isn’t regulated by any governing body, Xin adds. In fact, he points out that “natural” is actually on the FDA’s list of terms to define and regulate in the next year. Organic: With an official USDA seal, this term is the most regulated and reliable. To get certified, the hens must be raised in accordance with the USDA’s National Organic Program guidelines. “Certified organic eggs came from hens that were fed certified organic, non-GMO grain, free of hormones and antibiotics,” Ranney explains. What you can’t be confident of, though, is how the hen was treated, he adds. Hormone-free: This label sounds good, right? But it’s also a little bit deceptive — the American Egg Board points out that by law, laying hens are never fed hormones, so whether the carton calls it out or not, all eggs are hormone-free. Antibiotic-free: This label means egg producers didn’t use any antibiotics in the feed or water of the hens. The list of FDA-approved antibiotics for laying flocks is pretty short to start — just three — and the U.S. Poultry & Egg Association estimates that only a small percentage of hens ever receive antibiotics, although eggs from hens treated with antibiotics cannot be classified as antibiotic-free. But if the carton is rocking the USDA Certified Organic seal, the eggs are inherently free of antibiotics. Omega-3 Enriched: Hens were fed a diet enhanced with omega-3s, producing eggs with 100 mg to 600 mg of the nutrient, compared to the typical 30 mg.
Pasteurized: Eggs have been heated to a temperature just below the coagulation point in order to destroy possible pathogens in the egg yolks and whites. Color: “Egg color is denoted by the breed of chicken — some hens lay brown eggs, others white, others blue, others green,” Ranney says. Why are most eggs white? “Commercial industry feels they can get higher production from hens that lay white eggs,” he explains. Ranney adds that we’ve backed into the idea that brown eggs are healthier simply because they came from breeds that were less commercialized. But there’s no inherent difference in nutrition or flavor from one colored egg to another, he adds. Size: What’s the difference between a small and an extra large egg? Weight and nutrients. Certain breeds just tend to lay bigger eggs, Ranney says. But size does matter if you’re watching calories, cholesterol, or other nutrient levels, since they can vary depending on how big (or small) your egg is. 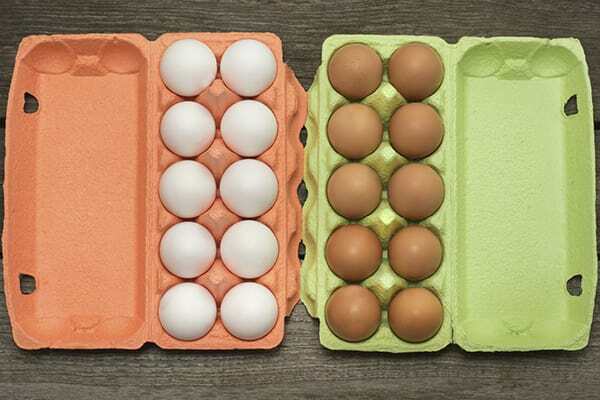 Grade: Eggs are graded on their interior and exterior quality, meaning how clean and smooth their shell is, then how thick their yolk is and clear the white is, according to the American Egg Board. The American Egg Board says Grade AA and A are ideal for poaching, frying, and cooking, while Grade B is good for scrambling and baking. Since most of us buy a single carton for all of the above, opt for an A or AA since they’re more universal (although you can still flip a mean fried egg with a B egg). We’ve become accustomed to graded eggs, but it doesn’t really tell you much as the average consumer, Ranney adds. Yolk: “The yolk color is determined by the hen’s diet,” Ranney explains. Free-range outdoor birds tend to have a deeper, darker-colored yolk because they’re getting more a more varied diet via grass and bugs as well as sunshine. And if you’ve ever cracked open an egg to find two yolks, this is a phenomenon where the hen ovulated two eggs (like twins) and the shell formed around both — although Ranney says there’s no way to tell from the outside that there’s a double surprise inside. Some eggs are more nutritious than others: The difference in the nutritional quality is a result of which diet the hens are on. A 2010 study found that eggs from pastured hens that were free to forage legumes and mixed grass had twice as much vitamin E and double the total omega-3 fatty acids than those fed a commercial diet in cages. Which Eggs Are the Best Choice? “Try and buy from a local farm. Knowing where your food comes from is the best way to know what quality you’re getting,” Ranney says. That means picking up eggs at the farmers’ market and asking how their hens are raised, their quality of life, and what kind of feed they’re given. Another option is to look for the “local” sign many grocery stores have started putting next to the price of items produced nearby. You can ask the store which farms produced the eggs and research how the hens were raised and fed. If your main concern is the treatment of the hens and the nutritional quality of your eggs, then look for pasture-raised eggs. But remember that since pasture-raised hens forage for their food (grass, worms, etc. ), they aren’t fed organically certified feed. If you prefer official certifications, then look for the seal of third-party auditing services, Animal Welfare Approved, the only U.S. label that requires farmers to provide pasture or range access for all animals in order to receive it. This way, you’ll end up with the most nutritious eggs from the happiest hens.